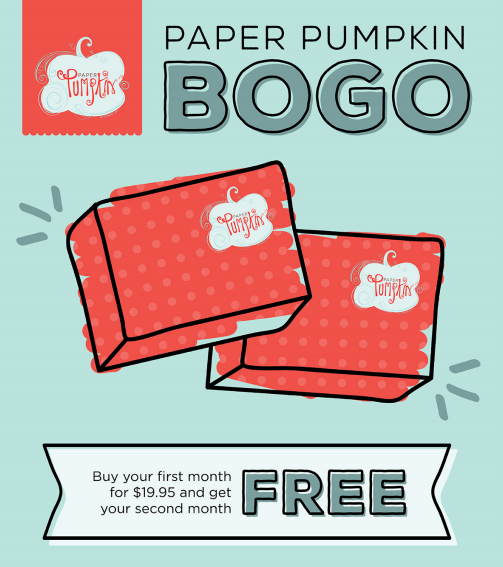 PAPER PUMPKIN BOGO = BUY ONE GET ONE FREE! STARTING TOMORROW! Offer Details: Use promo code “BOGO” and you’ll pay the regular price of $19.95 and get your second month for FREE! If you subscribe with the promo code between now and September 10, you will pay full price for the September kit and get the October kit FREE! If you subscribe between September 11 and October 10, your first kit will be the October kit and you'll get the November kit FREE!